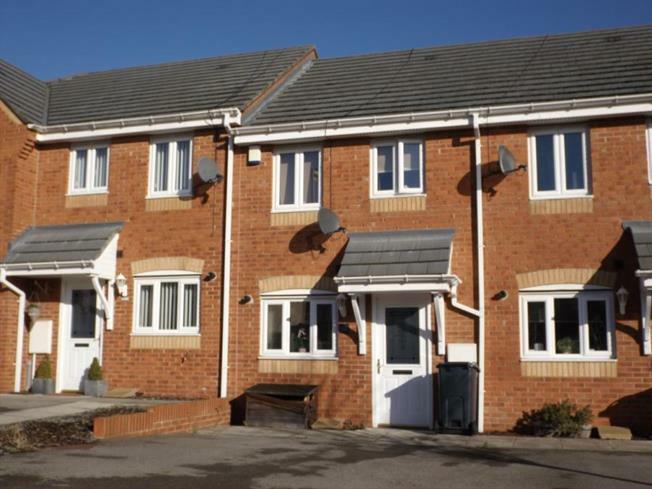 2 Bedroom Terraced House For Sale in Darlington for Offers Over £100,000. Double glazed entrance door with radiator and stairs to first floor. Wash hand basin, low level WC, radiator and extractor fan. Double glazed French doors leading to rear garden, television point, telephone point and radiator. Fitted with a range of wall and base units with work surfaces over incorporating a single drainer sink unit, built in electric oven and gas hob with extractor over, space and plumbing for automatic washing machine, space for fridge/freezer, part tiled walls, radiator and double glazed window to front aspect. Access to loft space and smoke alarm. Two double glazed windows to front aspect, built in wardrobe and radiator. White three piece suite comprising panelled bath with electric shower over, pedestal wash hand basin, low level WC, part tiled walls, extractor fan, radiator, double glazed window to rear aspect and airing cupboard housing water tank. To the front of the property is a driveway allowing of road parking. To the rear of the property is an enclosed garden which is mainly paved with gravelled areas, fenced boundaries and gated access.